Enjoy the beauty, reduced maintenance and increased home value of landscape curbing. One of the most innovative products in the landscape industry! AA Decorative Curbing, Inc, is bringing one of the most innovative products in the landscape industry to greater Salt Lake City, UT area including the cities of Riverton, Herriman, Draper, West Jordan, South Jordon, Sandy, Taylorsville, West Valley, Murray, Holliday, Cottonwood Heights, Lehi and Highland. You too, can enjoy the beauty, reduced maintenance and increased home value, by adding AA Decorative Curbing, Inc’s custom concrete curbing to your landscape. Concrete curbing is considerably more durable and easier to maintain than landscape borders of the past. Our curbing comes in many different sizes, shapes and colors. It will not rust, will not rot, will not shift, and there are no seams for weeds to grow through. It is a permanent weed barrier between grass and beds. Some designs even enable the homeowner to “retire their weedeater.” It can also be used to border sidewalks, driveways, putting greens, fish ponds and create walkways. Decorative concrete curbing is ideally suited for both home and business applications. 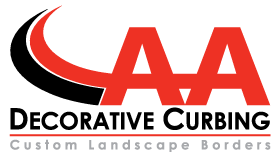 Call AA Decorative Curbing, Inc now to find out how our decorative landscape borders can improve YOUR curb appeal. A truly value-added improvement in one day! A wide range of colors, accents, and antique looks to choose from means every curbing job is unique! was far superior to other curbing I have seen. …yet has the versatility to please the most discriminating taste. Produced by a unique, automated process, decorative curbing compliments any landscape setting.